Joseph-Louis Lagrange is a giant in the history of mathematics. He made major contributions to the development of physics, celestial mechanics, calculus, algebra, number theory, and group theory. He was largely self-taught and did not obtain a university degree. Fascinated by maxima and minima of functions, Lagrange was the principle founder of the calculus of variations. In a far-reaching reformulation of Isaac Newton’s laws, Lagrange created a brilliant new vision of mechanics. He did this using the calculus of variations to reveal the broad implications of a single physical principle, virtual work. One result of this was the Lagrangian function, indispensable in advanced physics, calculated by subtracting potential energy from kinetic energy. Lagrange’s vision was based entirely on algebra and calculus. He believed this was more mathematically rigorous than intuitive ideas generated by geometry. He judged that his methods positioned mechanics within the realm of pure mathematics. In celestial mechanics Lagrange discovered the Lagrangian points, loved equally by science-fiction writers and planners of space observatories and stations. Lagrange gave us the familiar notation f′(x) to represent a function’s derivative, f′′(x) a second derivative, etc., and indeed it was he who gave us the word derivative. Introduced the ∂ notation and created the first partial differential equations. Gave the most generalized statement of the principle of least action of his era. Created an entirely new field of mechanics, Lagrangian mechanics, for both solids and fluids, based on the concept of virtual work and utilizing the Lagrangian function. Introduced the concept of generalized coordinates. Lagrangian mechanics can be used in any coordinate system – problems are simplified by choosing an appropriate one. Created the concept of potential: the gravitational field, for example, is a potential field. Solved century-old problems in number theory posed by Fermat that had defeated other mathematicians. Was a founder of group theory. Played a key role in the creation of the metric system of weights and measures. Joseph-Louis Lagrange was born into a prosperous family (his godparents were aristocrats) in the Italian city of Turin, Piedmont on January 25, 1736. At birth his name was Giuseppe Lodovico Lagrangia. The French form of his name is usually used because he wrote many of his papers in French and, in the latter part of his life, settled in Paris. As a teenager in Italy, Joseph began calling himself Lagrange. He had French ancestors on both sides of his family, which he seems to have taken pride in, although he always considered himself Piedmontese rather than French. After many years in Paris he kept his strong Italian accent. Joseph was named after his father, Giuseppe Francesco Lodovico Lagrangia, the king’s treasurer, responsible for Turin’s fortifications and infrastructure. Joseph’s mother was Maria Teresa Grosso, daughter of an eminent physician. Joseph was the eldest of their 11 children, only two of whom survived childhood. In 1750, at age 14, Joseph became a student at the University of Turin. Bored by the geometry of Euclid and Archimedes, he had no interest in studying mathematics. He planned to follow in his father’s footsteps and study law. His father, however, had run into financial trouble by speculating unwisely. Joseph’s interest in mathematics was sparked when he read a paper written in the previous century by Edmund Halley in which Halley used algebraic equations to describe the optical performance of lenses. In contrast to geometry, something about Halley’s algebra captivated him. He drifted away from law and began attending mathematics and physics lectures. Although he enjoyed these, it was soaking up cutting-edge books by mathematicians such as Leonhard Euler, Daniel Bernoulli, Colin Maclaurin, and Jean d’Alembert that catapulted him forward at a near-miraculous rate. Lagrange did not sleep much. He got into the lifelong habit of keeping himself awake for long hours of work with the aid of tea and coffee. Isaac Newton had produced his famous system of the world in Principia relying on geometrical ideas. Lagrange increasingly grew to believe that further progress in mechanics would be inhibited by geometry. He favored analysis – an entirely algebraic approach to calculus. In 1754, at age 18, Joseph Lagrange published his first mathematical work: Letter to Giulio Carlo da Fagnano. In it he described his discovery that the binomial expansion and the formula for the differential of a product have identical coefficients. This was not a new result, although at first he thought it was. 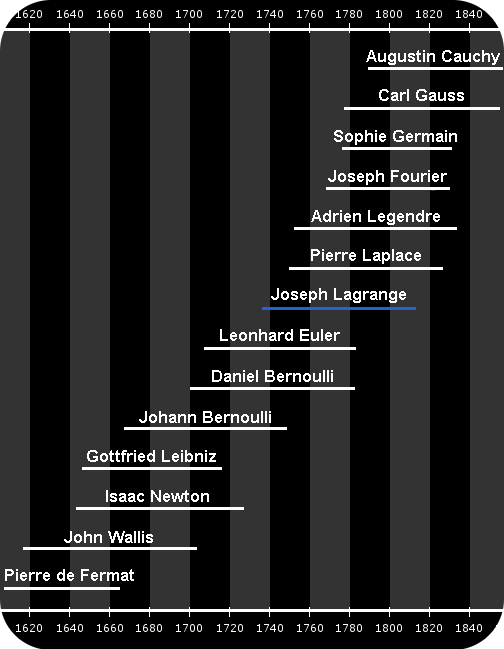 Joseph Lagrange’s lifetime and the lifetimes of related mathematicians. In August 1755, age 19, Lagrange sent a paper to the world’s greatest living mathematician, Leonhard Euler. He described his new method for finding maxima and minima of functions, a brilliant leap forward in calculus. In September 1755, Euler wrote back expressing his great admiration for Lagrange’s work. A few days later, Lagrange was offered and accepted a job as an assistant professor of mathematics at an artillery school in Turin – the Royal Military Academy. He left the University of Turin without a degree and began teaching calculus & mechanics. His students were all older than him and he was not the best of teachers – he was rather timid and his lectures were too advanced for his students. Subsequent correspondence between Lagrange and Euler led to a new branch of mathematics – the calculus of variations. Euler was so overwhelmed by the importance of Lagrange’s work that he proposed the young man from Turin be elected as a foreign member of the Berlin Academy. Lagrange was duly elected on September 2, 1756, at age 20. Lagrange always believed that founding the calculus of variations was his greatest work. It established him, while still a teenager, as one of the greatest mathematicians of the eighteenth century. Problem 19: Are the solutions of regular problems in the calculus of variations always necessarily analytic? This was solved by Ennio de Giorgi and John F. Nash. The answer is yes. Problem 20: Do all variational problems with certain boundary conditions have solutions? This generated an enormous amount of work carried out by a large number of mathematicians. The answer is yes. Problem 23: Further development of the calculus of variations is required. This is a problem that, as Hilbert acknowledged, does not have a definite solution. However, he considered the field so vital to the future of mathematics that he was happy to make it his final problem. Lagrange finally achieved his goal in the 1780s, describing his success in Analytical Mechanics in 1788. The single uniting principle turned out to be virtual work rather than least action. He first used virtual work in 1763 in a paper discussing the libration of the moon. Lagrange grew fed up of stuffy scientific attitudes in Turin. In 1757, he got together with two other former students to form the Turin Private Society. The Society’s aim was to cultivate scientific research in the fashion of the French and Berlin Academies of Science. In 1759, the new society began publishing its own journal in French and Latin: Mélanges de Philosophie et de Mathématique – Miscellany of Philosophy and Mathematics. In 1783, with the King’s support, the society became the Turin Royal Academy of Sciences. The Theory of Sound Propagation, including the first complete mathematical description of a string vibrating as a transverse wave. Also, the first use of differential calculus in probability theory. The theory and notation of the calculus of variations, solutions to dynamics problems, and deduction of the principle of least action. Solutions to more dynamics problems, the first use of the Lagrangian function, general differential equations describing three bodies mutually attracted by gravity, the integration of differential equations, and the solution to a century old problem Pierre de Fermat had posed in number theory. In 1764, Lagrange won the French Academy of Sciences’ Prize for his study describing why we only see one face of the moon and why we observe libration. 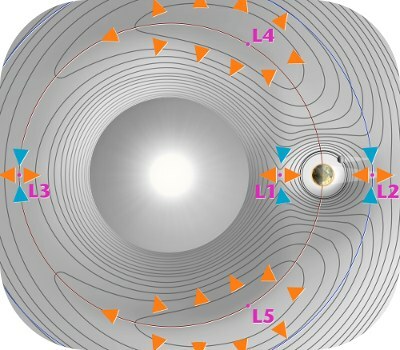 Libration is an apparent wobbling and rocking of the moon caused by orbital effects that allows us to see more of its surface than we might expect. As a result of the moon’s libration, when we observe it over a period of time, we can actually see about 59 percent of its surface rather than the 50 percent we might initially expect. Lagrange’s prize-winning entry was also significant because he used the principle of virtual work for the first time: later he used this principle as the foundation of Lagrangian mechanics. 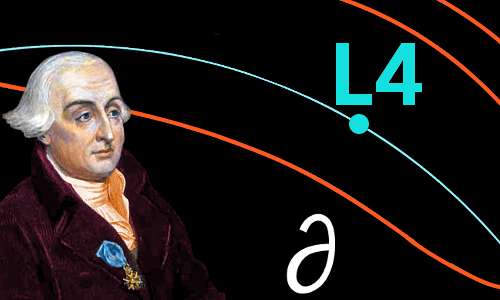 In 1766, Lagrange won the French Academy of Sciences’ Prize again, this time for his explanation of the orbits of Jupiter’s moons. At age 30, Lagrange moved to Berlin, replacing Euler as Director of Mathematics at the Prussian Academy of Sciences. The Academy had been trying to attract him since he was 19, but he had refused because he felt he would be in Euler’s shadow. The 20 years Lagrange spent in Berlin were his most productive. Although at times he had to stop work because of ill-health, when his health was good, he published original, valuable papers at the rate of about one a month. Most were published by the Berlin Academy, while others appeared in two further volumes of Mélanges de Philosophie et de Mathématique. In the 1770s and first half of the 1780s, Lagrange’s output on differential equations was prodigious, resulting in him creating the mathematics of partial differential equations. Differential equations can be used to describe change in the real world. They describe the relationship between a physical quantity, such as speed, and its rate of change. Ordinary differential equations describe a single changing quantity, such as speed. A probability density plot for an electron in a hydrogen atom’s 2p electron orbital. The plot is constructed from the solution of the Schrödinger equation – a partial differential equation. Lagrange created partial differential equations to describe more complicated situations in which more than one quantity is changing – in mathematical jargon, partial differential equations describe a function of several changing variables. For example, the Schrödinger equation is a well-known partial differential equation in quantum mechanics whose solution allows electron orbitals to be deduced. 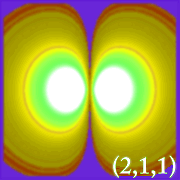 These orbitals describe the volume within which we expect to find an electron in an atom. Langrange’s theorem, dating from 1771, is that a subgroup’s order must always divide the order of the group exactly. This was one of the earliest steps in group theory. In 1772, Lagrange returned to a problem that intrigued him – the three body problem in gravity. His treatise on the subject, Essai sur le Problème des Trois Corps, led to him again winning the French Academy of Sciences Prize. He considered a situation in which there are two relatively high mass objects, such as the earth and sun, orbiting a mutual center of gravity. He calculated the gravitational potential for this type of situation, summarized in the contour map below. Gravitational potential contour map for the earth-sun system, showing the five Lagrangian points: L1, L2, L3, L4, L5. Where the contour lines are close together, the gravitational potential is high. Similarly where the lines are farther apart, gravitational potential is lower. Today NASA’s Solar and Heliospheric Observatory Satellite is located at the earth-sun L1 point, allowing the sun to be viewed without interruption from a stable platform. The James Webb Space Telescope, successor to the Hubble Space Telescope, is scheduled to be placed at the earth-sun L2 point in 2020. Lagrange completed his masterpiece, Analytical Mechanics, in Berlin in the early 1780s. It would be several years before he found a publisher. Lagrange was proud that his book contained no diagrams: he regarded mechanics as a branch of pure mathematics – a geometry of four dimensions – three of space, one of time. He believed greater truths would be found in the rigor of algebra and calculus fused in analysis than in what he saw as intuitive thinking represented in diagrams. He was proud to have removed mechanics from the province of geometry and placed it firmly within the domain of analysis. Lagrange worked everything out from a single fundamental principle: virtual work. Starting from this principle, to which he applied the calculus of variations, he produced the Lagrangian function in generalized coordinates, allowing a large number of problems in mechanics to be approached from a new direction, and previously insoluble problems to be solved. Although Lagrange wrote his masterpiece Analytical Mechanics, in Berlin, it was not published until 1788, after he had moved to Paris at the invitation of the French Academy of Sciences. In his early years in Paris, Lagrange was overwhelmed by depression and a lack of energy – he found nothing could hold his interest. Two things helped him out of his lethargy: his 1792 marriage to a young, sympathetic wife; and being appointed as president of the weights and measures commission in 1793. The French Revolution’s Reign of Terror began in 1793. Lagrange survived it. It helped that he was foreign. Also, he was mild-mannered and always did his best to avoid arguments and politics. Lagrange argued strongly for the adoption of the kilogram and meter. These were accepted by the commission in 1799. In 1794, the Ècole Polytechnique opened in Paris, with Lagrange, now age 58, appointed Professor of Mathematics. His lectures were savored by other professors. All but the most able students, however, found them too difficult. This was similar to the situation many years earlier when, as a teenager, he lectured in Turin. Sophie Germain, excluded from the Polytechnique because she was a woman, obtained Lagrange’s Analysis lecture notes and delighted in them: they were the best mathematics notes she had seen. Lagrange learned about Germain’s mathematical talent, visited her, and spread the word about her brilliance. In 1767, age 31, Lagrange married his cousin Vittoria Conti. He did not want children and the two were comfortable companions – they had known each other for some time. Neither of them enjoyed good health, and Vittoria was frequently ill. She died in 1783 after 16 years of marriage. Lagrange grieved for her deeply and became depressed. In Paris, in 1792, 24-year-old Renée-Françoise-Adélaide Le Monnier became devoted to Lagrange, who was 56. She met him through her father, the astronomer Pierre Charles Le Monnier. Renée felt sorry for Lagrange – he was a brilliant man who seemed to have lost his appetite for life; he seemed to be unusually sad and weary of the world. Renée decided to marry him, and stood firm against all objections. The two married and it turned out to be a happy union for both. They had no children. In 1802, Lagrange became a French citizen. Lagrange attended Roman Catholic mass regularly, although otherwise seems to have had said little about his religion. Joseph-Louis Lagrange died, age 77, on April 10, 1813 in Paris. Survived by his wife Renée, he was buried in the Panthéon, the final resting place of many eminent people including Voltaire, Victor Hugo, Lazare Carnot, Marcellin Berthelot, Paul Langevin, and Pierre & Marie Curie. When the Eiffel Tower opened in 1889, Lagrange was one of the 72 French scientists, engineers, and mathematicians whose names were engraved on plaques on the tower. "Joseph-Louis Lagrange." Famous Scientists. famousscientists.org. 30 May. 2018. Web.